The free agent market has been a little quiet thus far in the offseason, in part due to uncertainty regarding negotiations for the new CBA. Of course, by this time next week, there will be even more players on the free agent market once teams decide whether or not to tender a contract to players who are eligible for arbitration. 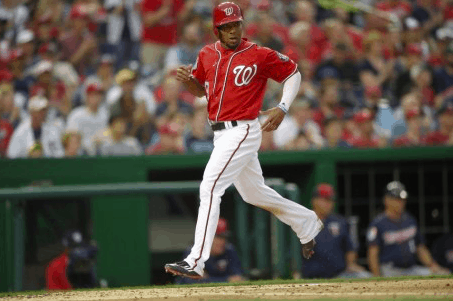 The Washington Nationals are currently mulling over just such a decision with center fielder Ben Revere. Most have assumed all along that the Nationals would decline the option to tender Revere a contract for 2017, but reports out of Washington indicate that GM Mike Rizzo hasn’t made up his mind about the matter, indicating it’s still an option. The Nationals acquired Revere in a trade with the Toronto Blue Jays last offseason. He was expected to become Washington’s every day center fielder, only to end up having the worst season of his career. Revere lost his job as the team’s primary center fielder, as rookie shortstop Trea Turner was getting most of the time in center field late in the season. Revere was even left off the team’s postseason roster, a drastic drop off after Revere had the best season of his career in 2015. The Nationals would like to move Turner back to shortstop in 2017, which leaves a void in center field, opening the door for the team to bring back Revere and give him another chance. From 2012 to 2015, Revere hit at least .294 and averaged 36 stolen bases per season. It’s hard to imagine the 28-year old already being past his prime and unable to replicate those numbers if he’s healthy in 2017. The possibility of Revere returning to his old self next season could be enough to convince the Nationals to give him another chance. Of course, if Revere were to struggle again in 2017, the Nationals may not have any other option but to stick it out with him, unless they move Turner back to center field, opening up a void at shortstop. Revere is also likely to make close to $8 million in arbitration next season, which would be a lot of wasted money if Revere has another poor year. The money he would make next season is playing a big role in Washington’s hesitancy to invite Revere back next season. It’s also believed in the baseball world that the Nationals will be aggressive this offseason, and so that $8 million could be used to sign a free agent outfielder like Dexter Fowler or Yoenis Cespedes, or possibly closer Aroldis Chapman. If the Nationals are serious about signing one of the elite free agents available, it’s unlikely they would retain Revere for $8 million. At this point, the Nationals parting ways with Revere seems like the most likely scenario. However, nothing is written in stone just yet, and if the Nationals are unsure if they’ll be able to upgrade their outfield in free agency, tendering Revere a contract for 2017 is still an option that’s on the table. What the Nationals ultimately decide with regard to Revere remains to be seen.